There was a strange atmosphere in the Paradiso Amsterdam. Just one day before the concert it was announced that Roy Kahn left Kamelot. Before the tour started Roy Kahn already announced he could not sing live because of medical and personal issues. 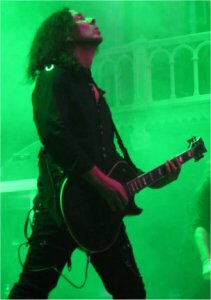 During this tour the lead vocal duties would be handled by Fabio Lione, vocalist for Rhapsody Of Fire vocalist. Of course many fans were shocked by this announcement but overall there was many respect for Roy's decision and all best wishes for future endeavors. The evening started with Sons of Seasons, the band formed by Kamelot keyboard player Oliver Palotai. I did not see that band because the concert started very early and I decided to enjoy the beautiful weather a bit longer. 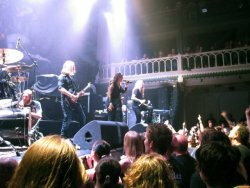 I entered Paradiso halfway the set of Amaranthe, a power/melodic death metal band with three vocalists. 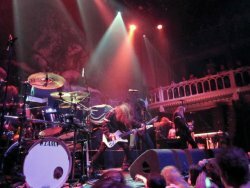 The band features Jake E. Lundberg for the clean vocals, Andy Solvestrom for the screams and Elize Ryd for the female vocals. Later on in the evening Elize Ryd joined Kamelot for the additional female vocals. Amaranthe sounded very good and got lots of response. Because of the three enthusiastic vocalists, each taking their turn at the front of the stage, there was a lot of interaction with the crowd. After that the stage was set for Evergrey, the well known progressive metal band from Sweden. The volume went up a notch and because I was standing right in front of the drummer the sound was not really good. From other people standing a bit more strategicly I heard that the sound was OK so next time I will move to a more descent spot. They played a set containing three songs from their new album Glorious Collision. The other six songs were well known songs from their back catalogue, amongst them Blinded and Recreation Day. A good performance by Tom S. Englund and co. who delivered what was to be expected. I was very curious how Kamelot would be welcomed, a strange thing to see a band play when the frontman left the band officially one day before the concert. Every bandmember was applauded with the loudest cheer for founder and guitar player Thomas Youngblood. Not all the people present were familiar with Fabio Lione but he was welcomed with a big cheer. Everybody was still amazed by the departure of Roy Khan but still willing to give this guy from Italy a fair chance. Strangely the focus was not an kamelot's latest album Poetry For The Poisoned, they started with the first two songs from Ghost opera. Two songs is also the total amount of songs from the new album present in the setlist. I do not know what the reason is for not playing the new material, maybe Fabio Lione is not familiar with the new songs or his voice suits the older songs better, who knows. Both Black Halo and Ghost Opera provided four songs to the setlist which was completed with 'classic' Kamelot songs. Personally I would have loved to hear Zodiac, my favourite song from the new album, but in the end I got enough other great songs, you cannot get it all. Biggest question of course was how Fabio Lione would do as replacement for Roy Khan. Well, he did a terrific job. His voice is different but he is blessed with a very powerful metal voice and his vocal capabilities are without a doubt tremendous. Though a different one his voice fitted the music of Kamelot very well. During some songs he was supported by Elize Ryd and Tommy karevik. They were standing on two platforms at each side of the drumkit and the stairs contained three pieces of fireworks that produced large balls of fire. Together with the huge flag at the back of stage with lights it was a visual treat without overdoing it. The opening of the set contained three songs from Ghost Opera to my surprise. I am not complaining, great songs, I just really thought I attended the wrong tour. The great Pandemonium was the first song from the new album followed by The Human Stain, for many a favourite from Ghost Opera. 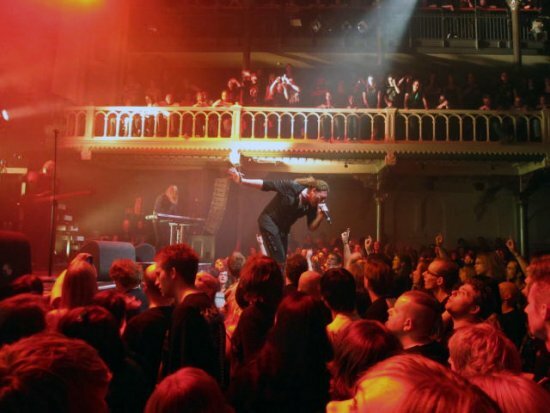 Then it was time for some old songs that were shouted along by many throats, the Paradiso was sold out so it was crowded. Then two fast songs from Black Halo really got the Paradiso moving. During the concert there was a lot going on. Of course the fire balls and the light show made it very interesting to watch but also the interaction between the band and crowd was great. One at a time Fabio, Thomas and bass player Sean Tibbets stepped on the extension in front of the stage and came very close to the people at the front of the crowd. Shaking hands, giving high fives and even allowing fans to touch the snares of the bass. It was great interaction between the band and the fans. 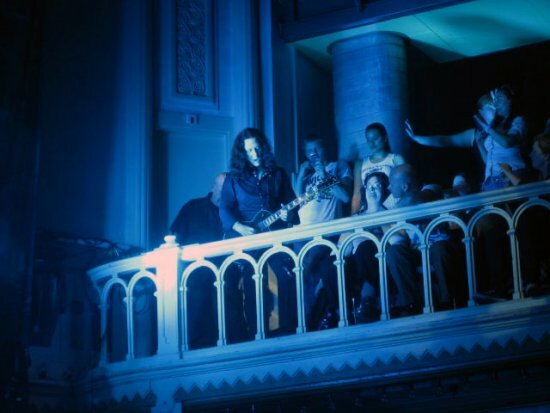 At some point Thomas Youngblood played his guitar on the first balcony so not only the people up front could come close. Fabio Lione did the major part of the lead vocals but on Eden Echo he got some time off. The lead vocals for that song were done by Tommy Karevik. He did a good job but he could not match the performance of Fabio. On Necropolis Fabio returned but the crowd got really excited when Simone Simons was introduced. Well introduced, they sort of said someone from the Netherlands was gonna come sing a song and the venue exploded. The Haunting was a winner from start to finish. Simone did a great job but just showing her face would have been enough, the crowd simply adored her. 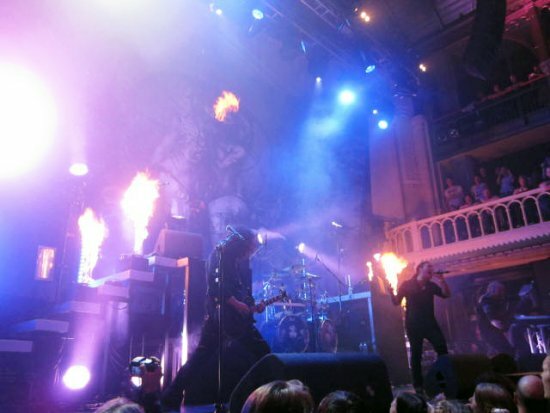 Kamelot really concurred the Paradiso and slowly worked to the end of the show. 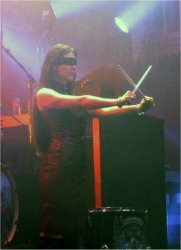 The climax was March of Mephisto, Elize Ryd entered the stage blind folded with a drum in her hand. The sound clearly came from drummer Casey Grillo but she did some great playback drumming. When the song really marched Casey swayed his arms from left to right fiercely hitting the skins on the drums. For many people this song was the highlight of the show. Without Roy Kahn Kamelot is still very impressive. Fabio Lione showed to be a good replacement but when reading the news announcement it is not evident that he is the man to get the job. Kamelot will have trouble permanently replacing Roy Kahn but for now I have a good feeling about this band. This evening showed that they are still going strong. Next time they come to the Netherlands I will be there.